Boy does it feel good to type on this blog again! I hope you are all doing well. I have a video coming up soon (hopefully tonight), and I will explain my absence. I noticed that Essence has a book club that is back in full swing, are you on board? The new book on the list is "The Perfect Marriage", find out more information here . I will likely use this list to make a few of my own reading selections. Here is a polish that I picked up during Black Friday, it is Victoriana by Butter London. As you can see in the picture below this blueish teal color includes a shimmery accent that makes your nails sparkle while foregoing the difficulty of traditional sparkle removal. 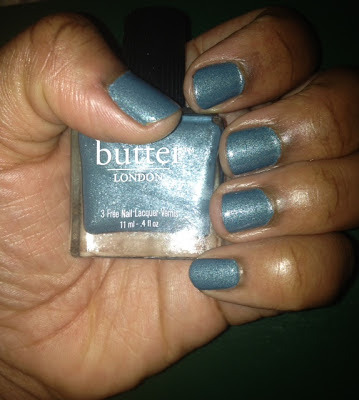 The 3 free formula Butter London polishes cost $15 but I was able to get this on sale for $10! Deals always make my feel better about my purchases. I hope you're all having a splendid day....chat with you very soon.